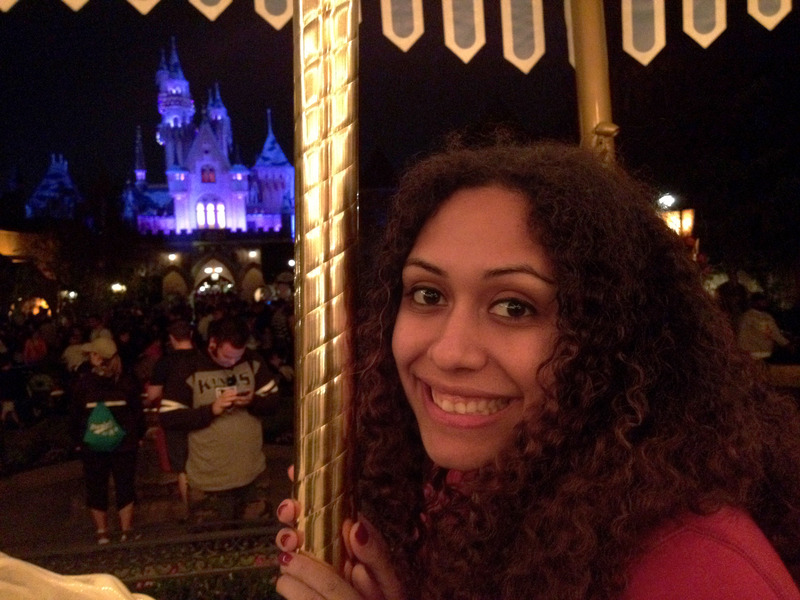 Disneyland, and all things Disney related, play a big part in our lives. On our third date, which was a lovely picnic in Barnsdall Park, I asked James if he liked theme parks. His response was, ‘I consider theme parks to be a serious art form.’ I don’t know what our lives would be like if it were any other way. As annual passholders, we get to enjoy unlimited trips to the parks, allowing us to follow the Imagineers’ brush strokes at a leisurely pace, and cultivate endless memories. 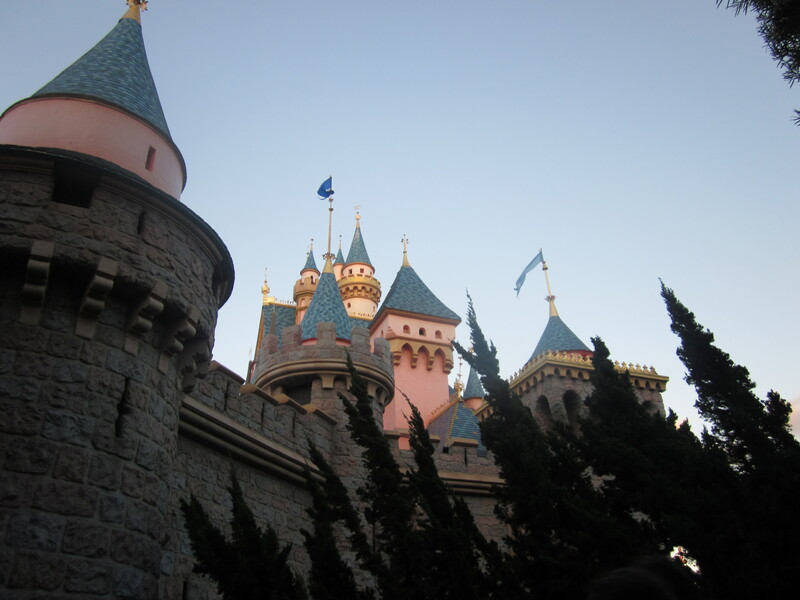 Motivated by our upcoming trip to Walt Disney World to visit James’ parents, we decided to share some of the memories from our past three years of adventures at Disneyland Resort here in California. 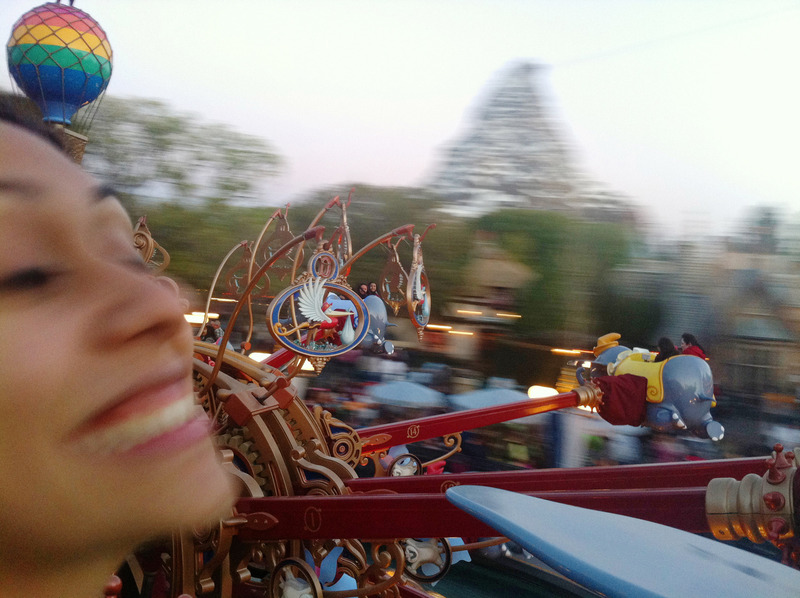 Here is one of James’ favorite photos of Emily’s fun day at Disneyland. 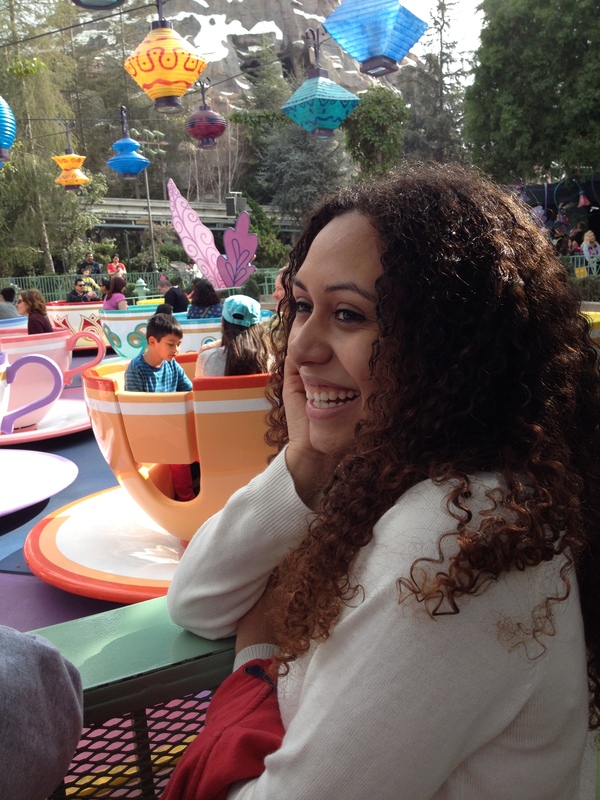 The whimsical shapes and vibrant colors of Mad Tea Party form the perfect backdrop for this smile. This is James’ favorite model (in the whole world). 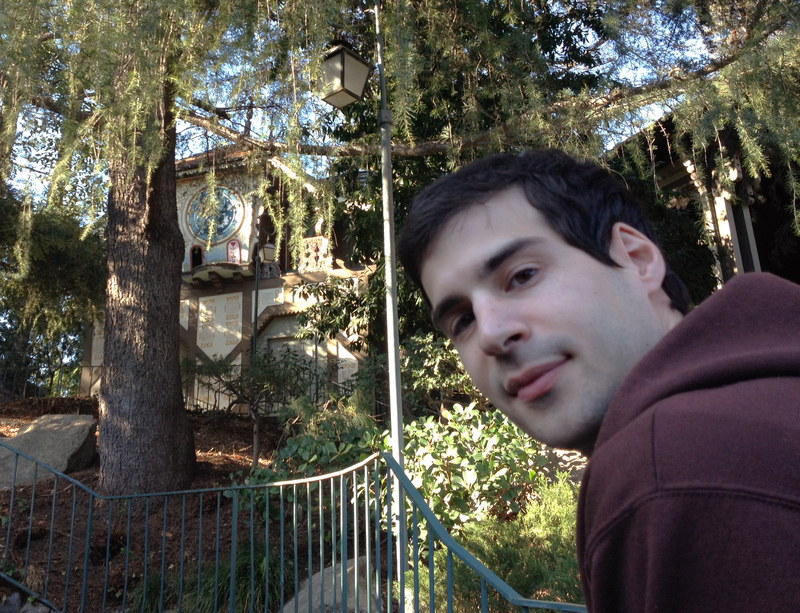 I’m pointing at Peter Pan’s Flight, which is my favorite attraction in the park. This photo was taken on the one occasion so far that we have ridden in the nose cone of the Monorail. The view going into Disneyland was spectacular. A relaxing breakfast at Carnation Café is always the best way to start the day. 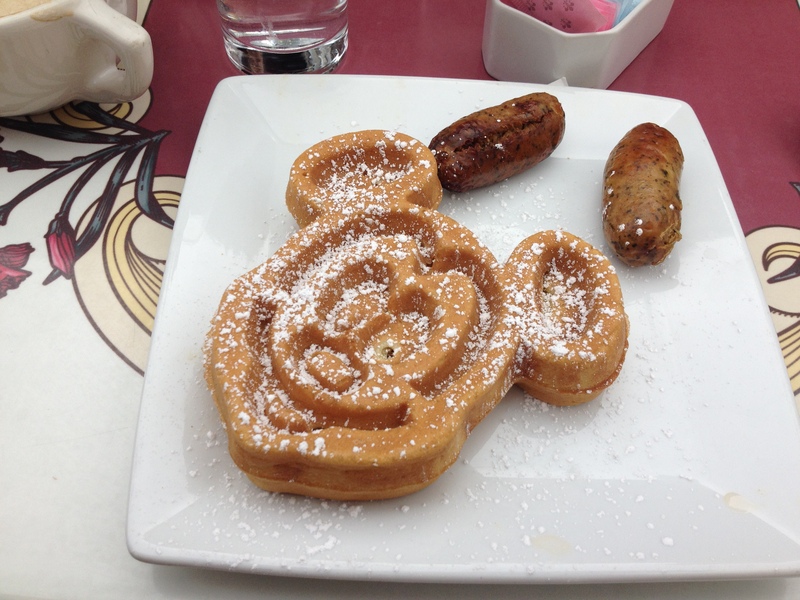 The Mickey Mouse waffle is a must. 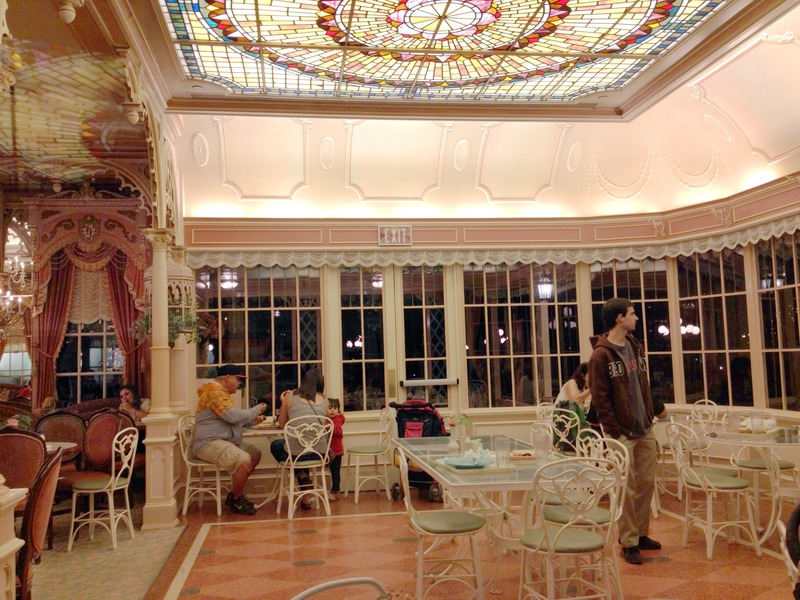 Even though it only opened a couple of years ago, Jolly Holiday Bakery Café has quickly become one of my favorite eateries at Disneyland Resort. The penguins are always eager to prepare and serve with flair. We were sitting on a bench outside of Big Thunder Ranch, resting our weary feet during our trek across Frontierland, when we saw Woody walking by. We were able to quickly sneak a photo before all of his admirers showed up. 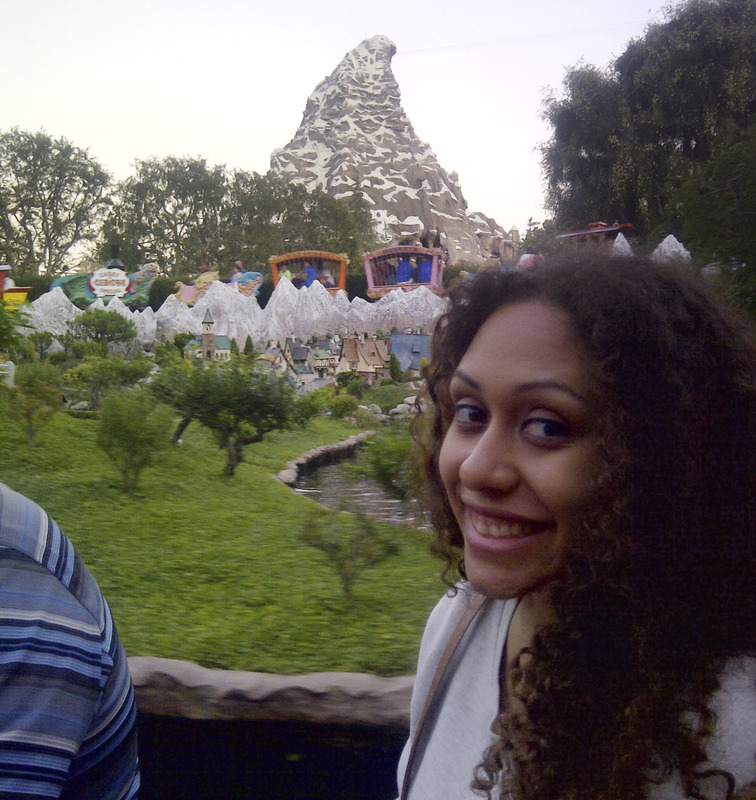 James was able to capture the thrill of my first flight on Dumbo the Flying Elephant, as we soared past the Matterhorn. 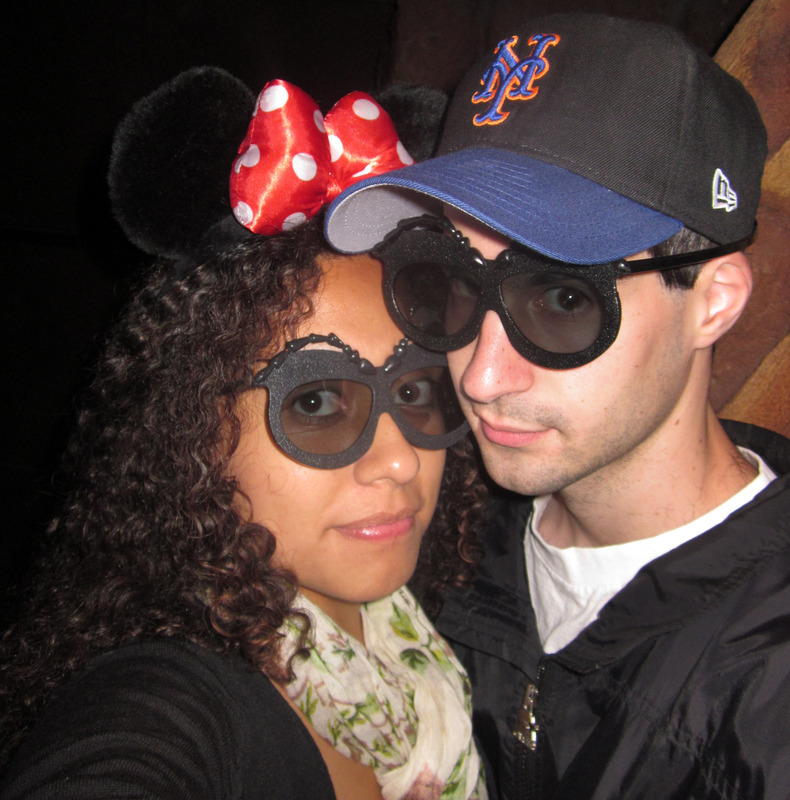 It’s not often that we have the chance to take photos of both of us together during our adventures in the parks. It’s also not often that one gets to be an honorary bug. What is to be done about ‘The Tomorrowland Question?’ That’s something that has sparked hours of discussion among our friends. Recent rumors have circulated that the entrance to Tomorrowland may look vastly different in the near future. The abandoned Fantasyland Skyway Station beckons us to travel deeper into this enchanted forest, but a gate stands in our way. There’s no telling how much longer the structure will be around. 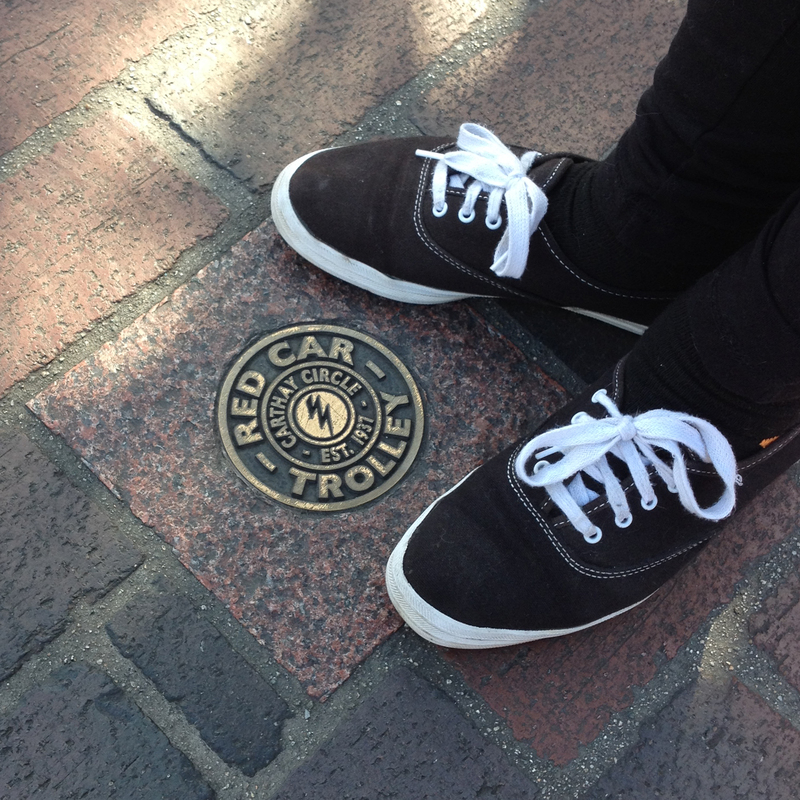 The small Red Car Trolley logo adds to the richly detailed setting of Buena Vista Street at Disney California Adventure. It is a Los Angeles that never was, and always will be. Here we are riding Casey Jr. 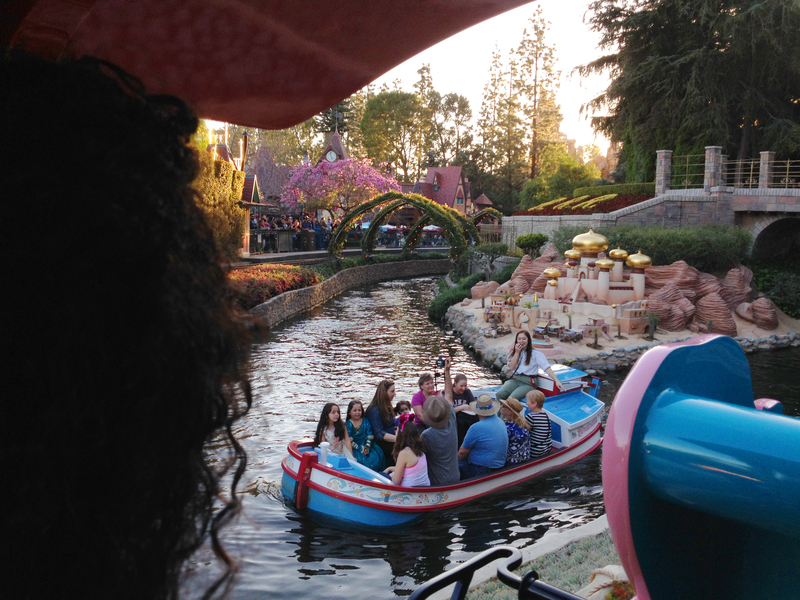 Circus Train overlooking the Storybook Land Canal Boats. The low sun gives Fantasyland a golden glow. This photo was taken purely by chance, as I am sure that if we ever tried to recreate this fleeting moment of magic while riding Big Thunder Mountain Railroad, we wouldn’t be able to. Over the holidays Jungle Cruise was rechristened Jingle Cruise, which meant that the lines were even longer than expected. The queue looped around through so much of the building that for the first time, we had the opportunity to walk along this little terrace and admire the rooftops of Adventureland poking out from the treetops. I get popcorn almost every time we go to Disneyland. It is hands down my favorite snack of all time. 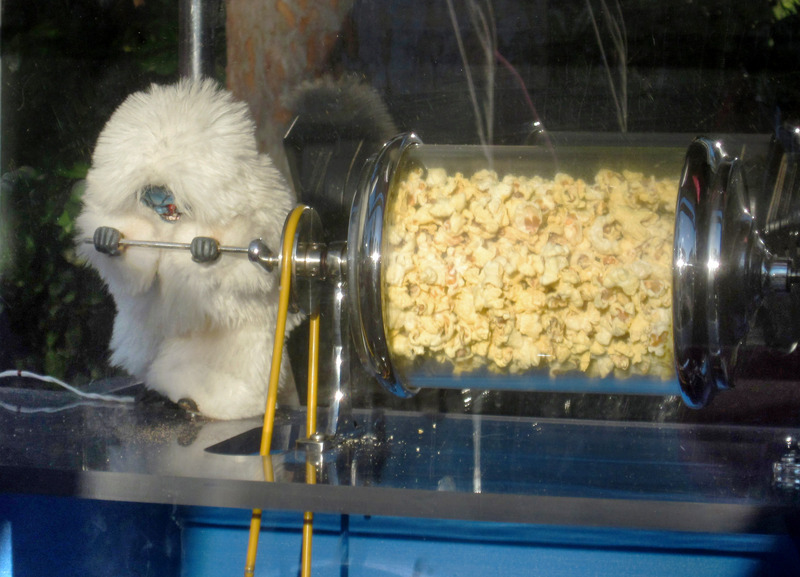 All of the carts feature a character spinning the glass tube, but Yetis certainly make the best popcorn. 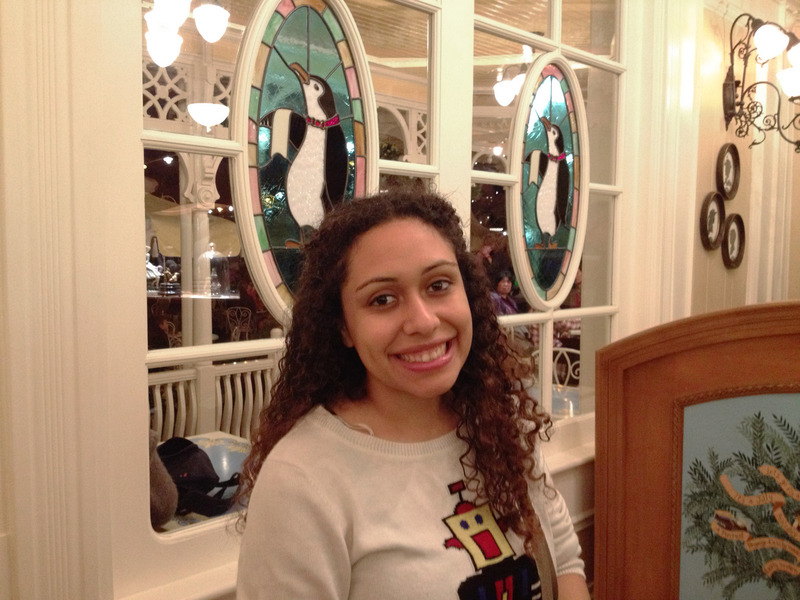 We don’t fancy fried chicken very much, but we do love the ambiance of Plaza Inn. There is a softness and warmth to this interior that cannot be equaled. It always surprises me that King Arthur Carousel never has a long line. Although it may not be the epitome of Imagineering, it is in my opinion the ride with the most significance. As many may not know, Walt Disney came up with the idea of Disneyland while taking his daughters to the carousel at Griffith Park. Shortly after James proposed in June 2013 we celebrated our engagement at Disneyland. We took that as an opportunity to have fun photographing my ring in the park. As you can see, Minnie Mouse and Donald Duck were both VERY impressed. We were riding Space Mountain and coming to the end of the ride when suddenly the vehicle came to a stop and the lights came on! We have heard of others having this experience, but were still surprised and excited. After sitting there with the lights on for a few minutes I can say that riding with the lights off is definitely preferred. Storybook Land creates some of the best sight sight lines in the park. Here the majestic view is combined with the kinetics of the Casey Jr. Circus Train travelling past. 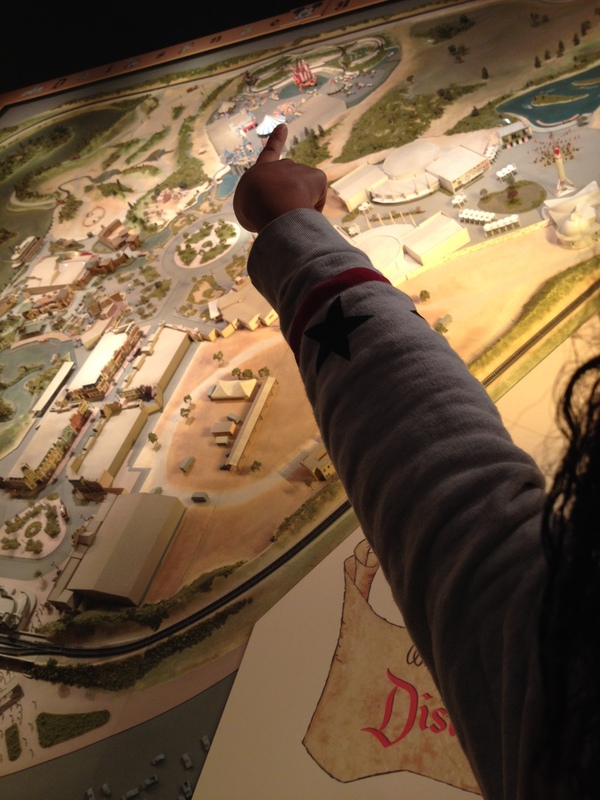 We always make it a point to fully appreciate the exhibits happening inside The Disney Gallery. 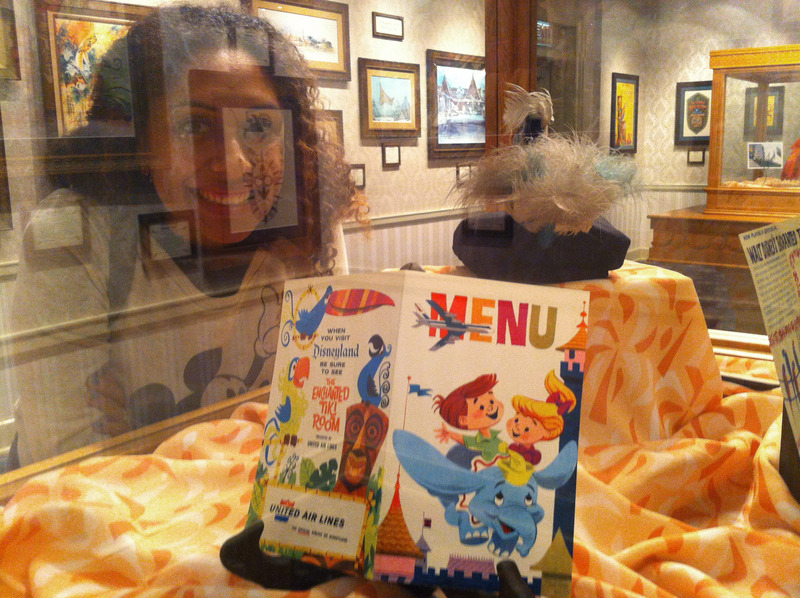 Last summer, the gallery had a few items commemorating the 50th anniversary of Walt Disney’s Enchanted Tiki Room. This was a menu that was used on United Airlines flights for children to promote the attraction in its opening days. Of course there are so many more wonderful places in the parks that we love. 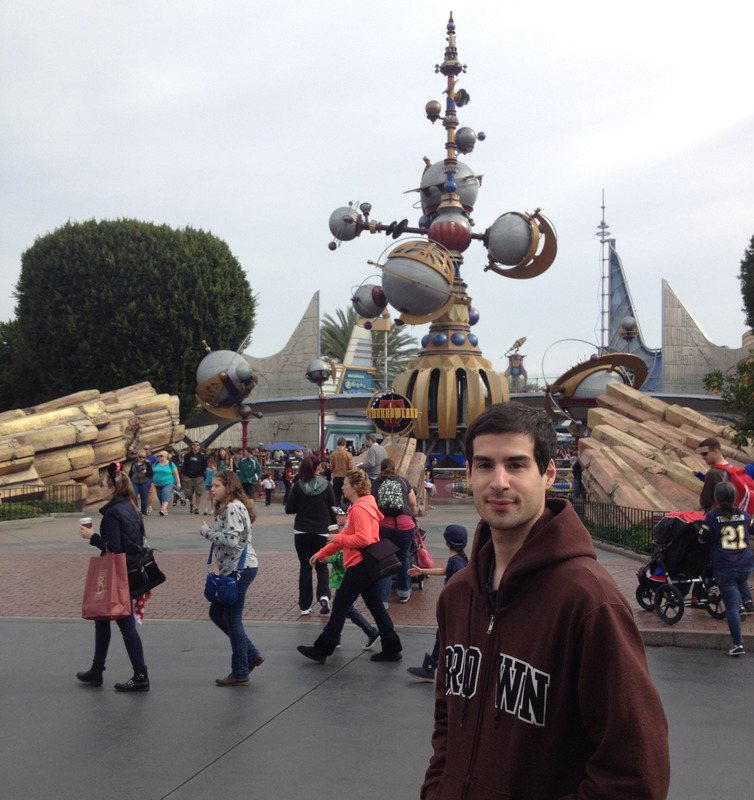 We are glad to live so close to the Disneyland Resort and plan to continue making many more years of happy memories. Having grown up in Guatemala, my parents did not experience American cuisine until they moved to this country when they were in their mid-twenties. For most American dishes, my mother took the basic structure and idea of the meal, and made up what she believed was in it, or what she thought would make it taste right. Therefore, my own initial exposure to American food came in whatever form my mother adapted it. I generally don’t like traditional meatloaf because I have been spoiled by (and accustomed to) my mother’s meatloaf, filled with vegetables and flavor. I like to pair this version of meatloaf with even more vegetables on the side (here I roasted squash), but you can make mashed potatoes or rice if you’re looking for something different. Heat oven to 350F. In a saucepan, sauté onions and garlic with heated olive oil until onions are translucent. In a bowl mix salt, pepper, egg, and ground beef. Chop greens into small pieces and add to ground beef along with onions, garlic, bell pepper, and bread crumbs. Mix thoroughly. Place mixture into a glass bread pan and cover with aluminum foil. Bake until meat is cooked through but still moist and juicy. Let cool for a few minutes before slicing and serving. Serve with your favorite meatloaf side dish and enjoy. Like many couples, James and I love taking weekend getaway trips. Living in Southern California means that most of the time these destinations are within a few hours’ drive. Here are some photos from a couple of our adventures in Southern California thus far. We have been to San Diego twice now, which I suppose is a relatively small number considering how nearby it is. We most certainly intend to go many more times, as we thoroughly enjoyed our trips there. These memories are from our first trip to the city in 2012. 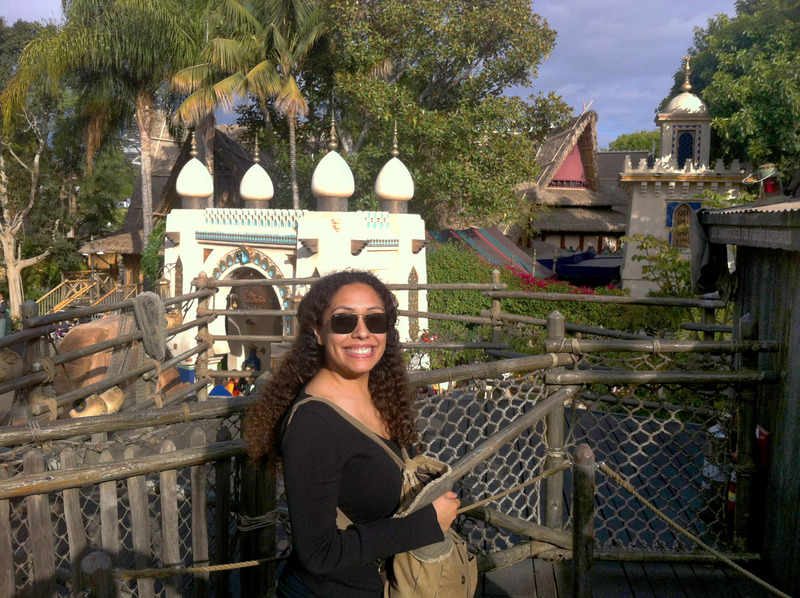 Our favorite part of our San Diego weekend was the grand and beautiful Balboa Park. We spent hours in the park, roaming past the edifices and gardens, taking in sunlight, and admiring everything it had to offer. The park is filled with magnificent structures that were designed for the Panama-California Exposition in 1915. 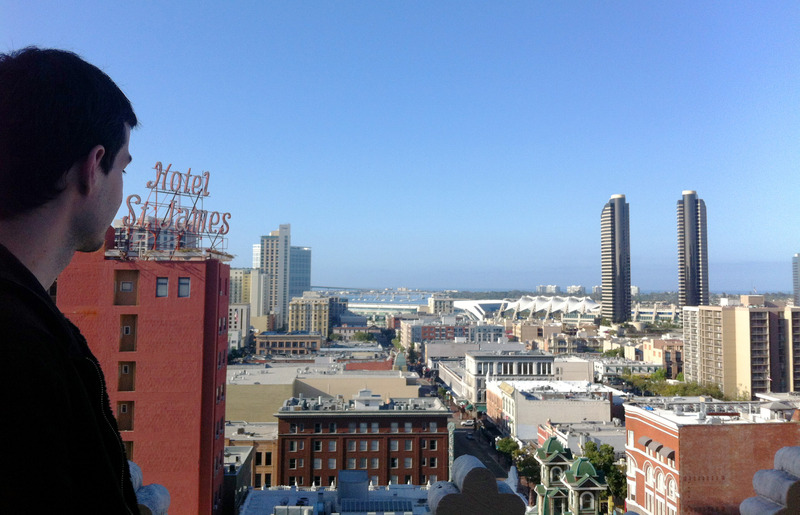 We stayed at a lovely hotel in the Gaslamp Quarter, where we had rooftop access to admire the historic district from above. The Gaslamp Quarter is densely packed with Victorian Era landmarks, and is such a pleasure to tour. 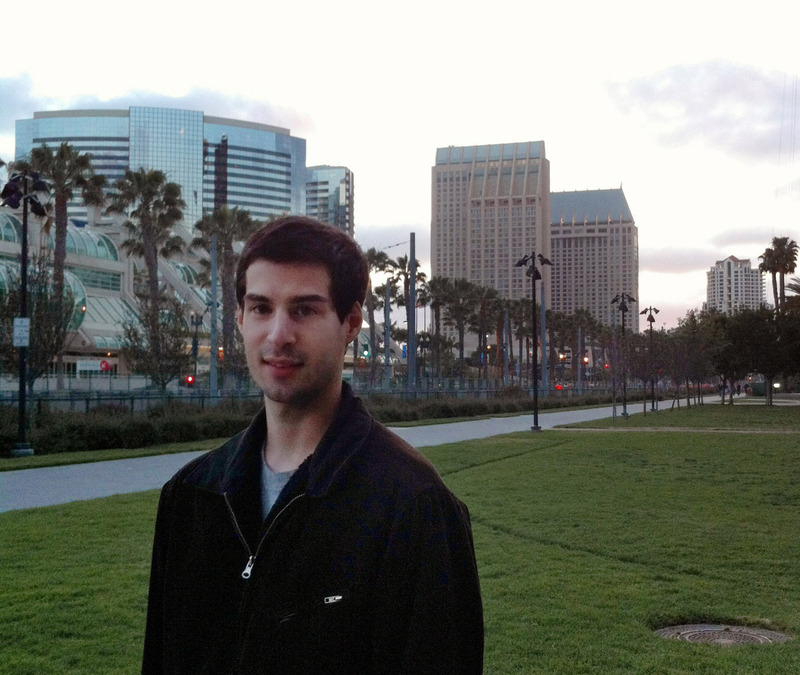 James had visited the San Diego Convention Center once before this trip, and was very glad to have this opportunity to see it without the Comic-Con crowds. 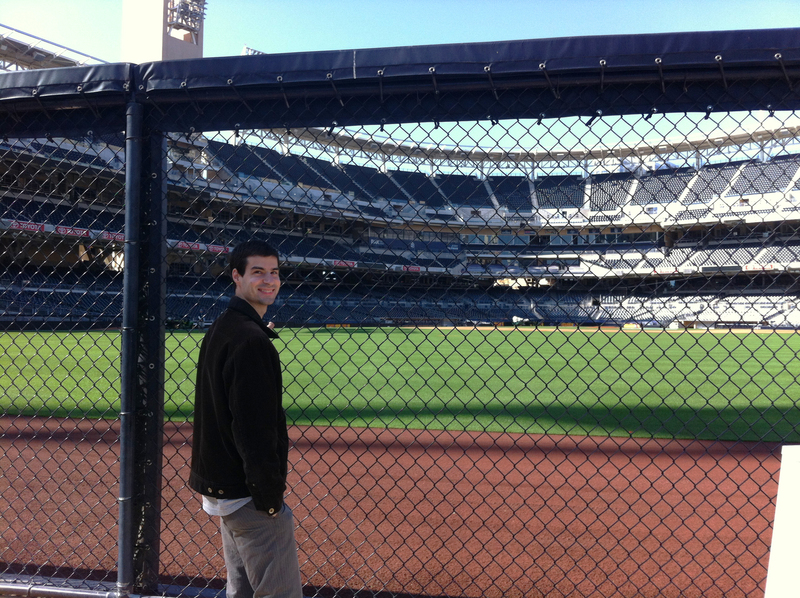 The next morning we headed to Petco Park before driving back to Los Angeles. It has become a tradition to visit the sports complexes of every city we visit, and we hope to see many more across the country on our travels. On a different trip south of Los Angeles, we decided to stop by San Juan Capistrano. We did not stay for very long, but were glad to have the opportunity to visit the mission. 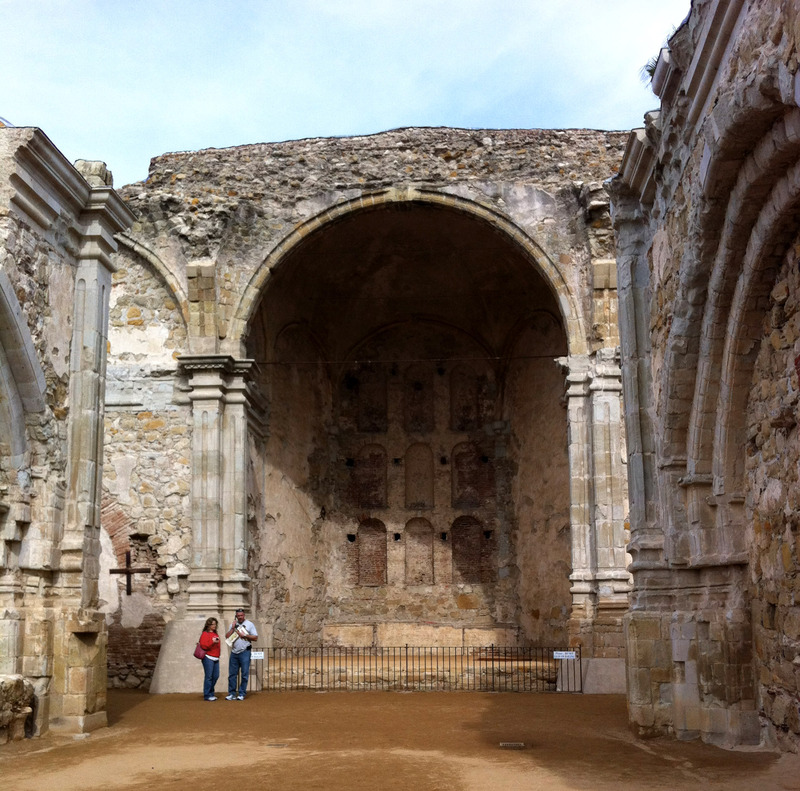 This was the first time that we had toured the interior of any of the missions along El Camino Real. The crumbling ruins of the mission are a sight to behold. With wedding planning going on, it’s unlikely that we will be taking as many weekend getaways this year. Perhaps we will find time to explore a few new places in the upcoming months. We invited a couple of friends over a few weeks ago and instead of going out for the evening we decided to stay in for a wine and cheese night. It’s turned into a fun evening of chatting away and trying new delectable combinations, and oh what a feast we had. Personally, I am a red wine drinker, but we decided to stick to lighter wines this time around to experiment with flavors while keeping it cohesive. We wanted an array of textures when it came to the cheeses. We decided on gouda, sharp cheddar, brie, goat cheese, and burrata. We put a lot of emphasis on the sides to accompany our wine and cheese. We had a lot of variety from pates, grilled vegetables, pickles, savory jams, and a selection of sliced deli meats. These are all especially important if any participants are lactose intolerant or sensitive. We used baguette slices and peppered crackers as the bases for all the fun combinations. The best part for us as hosts was being able to just fill up and relax knowing that we wouldn’t have to drive home and find street parking at the end of the night.